20% off ActiveSync for MDaemon licences – get those smartphones connected! We’re running a terrific end of year promotion and the perfect opportunity to get your staff fully connected in preparation for a productive and profitable 2014. 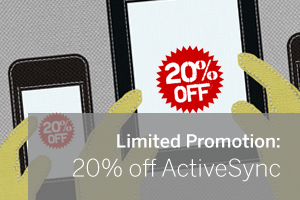 Simply purchase a new copy of ActiveSync for MDaemon Messaging Server via our Web site before the end of 2013 and you’ll automatically receive 20% off the RRP’s listed. To enable the fully functional ActiveSync trial simply visit the ‘Mobile Device Management’ console within MDaemon (Setup -> Mobile Device Manager) and enable the ‘ActiveSync server’. There’s still plenty of time to give it a good test with your devices – more information and pricing is available on our Web site.